We all have aches and pains from our daily lives, and nothing helps remove those pains like a good massage. Professional massage sessions are not cheap, and the time taken to schedule one may not allow you to get one every day. The next best thing to having a personal masseuse appointment every day is to purchase an electric massager that can be used at home by anyone. That’s where the Pure Wave CM7 massager fits in perfectly. This type handheld massager can release muscle tension, help with joint stiffness, end cramps, loosen knots in muscles and make muscle spasms a thing of the past. The Pure Wave CM7 is ergonomically designed, lightweight and portable so that it can be used anywhere and anytime. If you need a daily massager, this is the one to get. The Pure Wave CM7 has two massage motors built in – one that performs percussion techniques, and the other that provides vibration modes. The percussion modes are perfect for getting to deep tissue that needs attention. The vibration modes are soothing and help relax the body by focusing on the surface of the muscles. Having the combination of both styles in one massager is rare, and makes this massager work for everyone. Whether your body needs those deep knots worked out, or you just need a relaxing touch to calm a weary body and stimulate blood flow, then this massager can handle either need. One of the biggest issues with many massagers is that they are built with a one-tip can do it all concept. The Pure Wave CM7 knows better and includes different tips for different needs. The added benefit of being cordless gives this massager more ways it can be used. Cords get in the way and make it more difficult to reach those tricky spots that need attention. Without having to struggle with the cord getting in the way or needing to find an outlet nearby that means you can truly take this massager anywhere. Use it at the gym, on the beach, in hotel rooms, on a plane, in the car… the possibilities are endless. While being cordless is great, it takes a strong battery to keep the massager going when you need it. The Pure Wave CM7 comes with a powerful two cell, 7.2 Volt lithium-ion battery, which can last up to three hours of continuous use on a single charge. The battery recharges swiftly too, topping up in less than an hour with its fast charge design. Using a massager that is too heavy or awkward to hold can tire out your hands and arms before you get the full benefit of the massage you need. The CM7 weighs 1.75 pounds, making it one of the lightest massagers of this class on the market. By keeping the weight of the massager down, that lengthens how long it can be used for before tiring out your arms. The ergonomic design also aids in being able to hold the massager for long periods of time without causing pain or discomfort. Not only is the CM7 easy to hold, but it is designed so that it is held correctly, which keeps it from being able to cause new pain or discomfort to the hands or wrists because of using it. If anything should fail or break during normal use then the one year warranty will allow for repair, part replacement or full replacement of the CM7 as needed. Of course, it goes without saying that if the user tried to make any modifications or if it was broken in a way that wouldn’t be considered normal use, then the warranty won’t be honored. Each issue is looked at on a case-by-case basis, so how the warranty is applied really depends on what happens to the massager. Some parts can be replaced by the consumer, some have to be replaced by a qualified technician and others are just not economical to replace so the whole unit can be replaced. 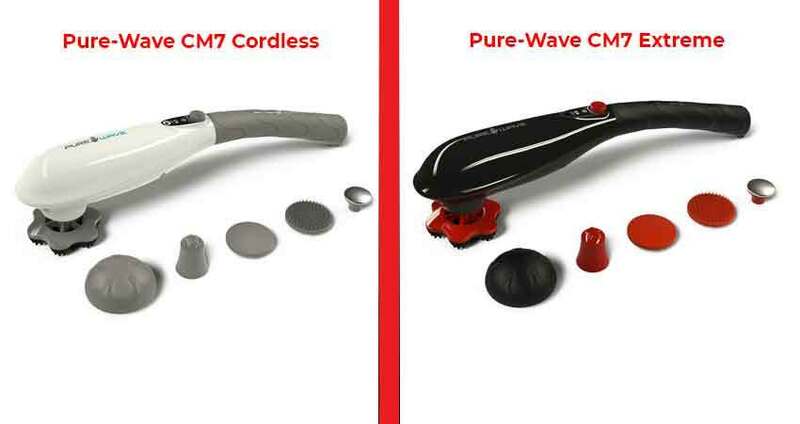 All the options of the Pure Wave CM7 Massager are an incredible value. The dual motor system that provides both percussion massage and vibration massage offer such a large variety of uses that it can meet anybody’s needs. Along with those different modes of massage, the multiple types of tips help target exactly what you need to be massaged. Considering the Pure Wave CM7 comes with such a powerful battery system, fast charging capability, and is lightweight enough for individual use over long periods means it is clearly an excellent option for home massage use. The portability makes it excellent for people on the go, or whenever you’re traveling for fun. The great warranty means that if anything goes wrong it will be swiftly taken care of. Without a doubt, the Pure Wave CM7 is well worth the investment. Unless you explicitly need a massager that needs to be plugged into the wall, then this massager can handle whatever you need. This is a product that is a great addition to any home.